This is symbolic on several levels. MOSCOW, February 15 - The embalmed corpse of ex-Soviet leader Vladimir Lenin could remain on view in his tomb on Red Square for another 100 years, if no decision to remove it is taken, one of its curators said on Friday. One of the experts who cares for the corpse, Yuri Denisov-Nikolsky, said that if the body "receives proper care it could remain in the mausoleum for another 100 years." The mausoleum's continuing presence in the heart of Moscow has been a source of considerable controversy since the collapse of the Soviet Union in 1991. Demands to transfer the body of the architect of the 1917 Russian Revolution to a regular cemetery have been countered by Russian Communists, who insist that the tomb in Red Square remain the Soviet leader's final resting place. 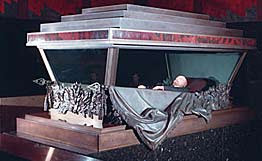 Lenin's body, with its face uncovered, has been on public display in a glass sarcophagus since his death in 1924. Another expert, Professor Valery Bykov, said modern technology would allow the body to be kept in good condition for many years to come. "We believe the body can be maintained for an extremely long period," he said.